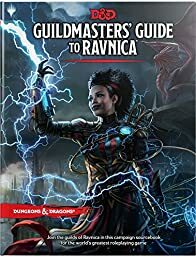 In Guildmasters' Guide to Ravnica, the world's most popular roleplaying game meets the world's most popular trading card game. Released to coincide with the Magic set Guilds of Ravnica, it's the perfect blend of story from the creators of Magic: The Gathering, wrapped around the rules, monsters, and magic of fifth edition Dungeons & Dragons. Dungeons & Dragons Waterdeep: Dungeon of the Mad Mage (Adventure Book, D&D Roleplaying Game) (D&D Adve..
Dungeons & Dragons Guildmasters' Guide to Ravnica Maps and Miscellany (D&D/Magic: The Gathering Access..